After devoting two Stogie Spirits articles to scotch and having both be blends, I thought it was time that I turned my attention to a single malt. Compared to many scotches, the Balvenie Doublewood 12 Year is relatively easy to find, and the price is $40-50 a bottle—quite reasonable considering the lofty prices that many single malts fetch. The Balvenie Doublewood Single Malt Scotch Whisky is a 12 year old single malt which gains its distinctive character from being matured in two woods. During its period of maturation it is transferred from a traditional oak whisky cask to a first fill Spanish oak sherry cask. Each stage lends different qualities to the resulting single malt—the traditional casks, having previously held bourbon, soften and add character, whilst the sherry wood brings depth and fullness of flavour. The description is apt. The Balvenie is far smoother than many single malts with little of the burning that sometimes accompanies the initial smell. Instead, on the nose I find oak, vanilla, and honeycomb. The color is a medium brown caramel. On the palate, I find more of the wood notes, with oak and subtle cedar. There is a touch of citrus (orange peel perhaps) and some sherry flavors, likely imparted by the sherry cask. The finish is long and balanced. My overall experience with this scotch can be summed up in one word: smooth. From the nose to the body and the finish, the whiskey is balanced and never harsh. This makes it a very approachable single malt for those just getting acquainted with Scotland’s single malts, but it also has plenty of complexity for the more seasoned scotch drinker. That combination of smooth but complex makes the Doublewood versatile when pairing with cigars. Anything from a mild/medium to full-bodied cigar would make a solid accompaniment and, in a rarity for a single malt scotch, I even think that it can stand up to the sweetness of some maduros. 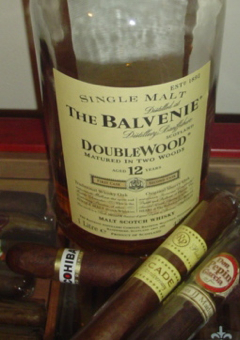 Two Cuban cigars that I enjoyed with the Balvenie Doublewood were the robusto-sized Bolivar Royal Corona and the Cohiba Maduro Magicos. But don’t think for a minute that only Cuban cigars will pair with this single malt. I would also recommend the Alonso Menendez, Arturo Fuente King B, Ashton VSG, Padilla Miami, or a San Christobal. what is that whit label Cohiba in the picture? I don't think I've seen that before. That would be the new Dominican Puro Cohiba put out by General Cigar at this year's IPCPR.